A Power of Attorney is used to give someone you trust the legal authority to manage your financial, property, and/or legal matters. Often, a Power of Attorney is used to ensure that your affairs will be administered according to your wishes in the event that you become mentally or physically incapable. Alternately, it may be convenient for persons who will be away for an extended period, and unable to personally sign documents or make financial and property decisions. This is where the Power of Attorney will actually be used - in other words, the physical location of the property or assets that are being controlled. Where will the Power of Attorney be used? The Principal is the person who is granting the powers. Each person whom the Principal is granting powers to is called an Attorney-in-Fact, or Agent, depending on the jurisdiction. If you choose two, they can make decisions "jointly" (MUST have consent of other Attorney-in-fact) or "jointly and independently" (do not require consent of the other Attorney-in-fact to make decisions). In Colorado, you can only have ONE Attorney-in-fact. In Illinois, you can only have ONE Attorney-in-fact. How many Attorneys-in-fact do you wish to have? If your Attorney(s)-in-Fact are unwilling or unable to exercise their powers, the Successor Attorney(s)-in-Fact will be able to exercise them. Do you wish to name any Successor Attorneys-in-fact? How many Successor Attorneys-in-fact do you wish to name? Can your Attorney(s)-in-fact and Successor Attorney(s)-in-fact delegate their authority to others? Do you wish your Attorney(s)-in-fact to be compensated? Can your Attorney(s)-in-fact personally benefit from control of your assets? Does your Attorney(s)-in-fact co-own some of these assets? A Durable Power of Attorney will remain effective if you lose mental capacity. It can come into effect immediately, or only once you become incapacitated. A non-Durable Power of Attorney will automatically end upon your incapacitation, or at a time you specify. Do you wish to create a Durable Power of Attorney (one that will remain effective if you become incapacitated)? Do you wish to specify a termination date for your Power of Attorney? Who will decide if you are incapacitated? A guardian is somebody who physically cares for and has custody of a disabled adult, whereas a conservator manages their property and affairs. Often, one person takes on both roles. Do you wish to nominate your Attorney-in-fact as your guardian/conservator if you ever need one? Do you wish your Attorney-in-fact to prepare financial reports? Do you wish to restrict the powers of your Attorney-in-fact? To ensure the validity of this document, have it signed in the presence of a Notary Public and one or more witnesses. This will make your document more acceptable at financial institutions and other organizations. Please choose the appropriate options below. In Arizona, your Power of Attorney MUST be signed in front of a Notary Public and at lease one witness (who is NOT the Notary Public, Attorney-in-fact, or Attorney-in-fact's spouse or child) to be valid. Please choose the appropriate options below. In Arkansas, your Power of Attorney MUST be signed in front of a Notary Public to be valid. Also, to make your document more acceptable at financial institutions and other organizations, we recommend the presence of one or more witnesses. Please choose the appropriate options below. In California, your Power of Attorney MUST be signed in front of a Notary Public OR two witness to be valid. However, we highly recommend signing in front of both, as some financial institutions will not accept the document otherwise. Please choose the appropriate options below. In Colorado, your Power of Attorney MUST be signed in front of a Notary Public to be valid. Also, to make your document more acceptable at financial institutions and other organizations, we recommend the presence of one or more witnesses. Please choose the appropriate options below. In Connecticut, your Power of Attorney MUST be signed in front of a Notary Public to be valid. Also, to make your document more acceptable at financial institutions and other organizations, we recommend the presence of one or more witnesses. Please choose the appropriate options below. In the District of Columbia, your Power of Attorney MUST be signed in front of a Notary Public to be valid. Also, to make your document more acceptable at financial institutions and other organizations, we recommend the presence of one or more witnesses. Please choose the appropriate options below. In Florida, your Power of Attorney MUST be signed in front of two witnesses to be valid. Also, to make your document more acceptable at financial institutions and other organizations, we highly recommend the presence of a Notary Public. Please choose the appropriate options below. 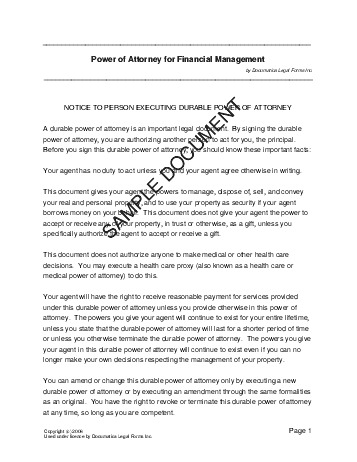 In Georgia, your Power of Attorney MUST be signed in front of two witnesses to be valid. At least one of the witnesses cannot be the Principal's spouse or blood relative. If your Attorney(s)-in-Fact will be handling real property transactions, the presence of a Notary Public is REQUIRED by law. Please choose the appropriate options below. In Illinois, your Power of Attorney MUST be signed in front of a Notary Public and at lease one witness (who is NOT the Notary Public) to be valid. Please choose the appropriate options below. In Indiana, your Power of Attorney MUST be signed in front of a Notary Public to be valid. Also, to make your document more acceptable at financial institutions and other organizations, we recommend the presence of one or more witnesses. Please choose the appropriate options below. In Maine, your Power of Attorney MUST be signed in front of a Notary Public to be valid. Also, to make your document more acceptable at financial institutions and other organizations, we recommend the presence of one or more witnesses. Please choose the appropriate options below. In Michigan, your Power of Attorney MUST be signed in front of two witnesses to be valid. Also, to make your document more acceptable at financial institutions and other organizations, we highly recommend the presence of a Notary Public. Please choose the appropriate options below. In Minnesota, your Power of Attorney MUST be signed in front of a Notary Public to be valid. Also, to make your document more acceptable at financial institutions and other organizations, we recommend the presence of one or more witnesses. Please choose the appropriate options below. In Missouri, your Power of Attorney MUST be signed in front of a Notary Public to be valid. Also, to make your document more acceptable at financial institutions and other organizations, we recommend the presence of one or more witnesses. Please choose the appropriate options below. In Montana, your Power of Attorney MUST be signed in front of a Notary Public to be valid. Also, to make your document more acceptable at financial institutions and other organizations, we recommend the presence of one or more witnesses. Please choose the appropriate options below. In Nebraska, your Power of Attorney MUST be signed in front of a Notary Public to be valid. Also, to make your document more acceptable at financial institutions and other organizations, we recommend the presence of one or more witnesses. Please choose the appropriate options below. In Nevada, your Power of Attorney MUST be signed in front of a Notary Public to be valid. Also, to make your document more acceptable at financial institutions and other organizations, we recommend the presence of one or more witnesses. Please choose the appropriate options below. In New Jersey, your Power of Attorney MUST be signed in front of a Notary Public to be valid. Also, to make your document more acceptable at financial institutions and other organizations, we recommend the presence of one or more witnesses. Please choose the appropriate options below. In New Mexico, your Power of Attorney MUST be signed in front of a Notary Public to be valid. Also, to make your document more acceptable at financial institutions and other organizations, we recommend the presence of one or more witnesses. Please choose the appropriate options below. In New York, your Power of Attorney MUST be signed in front of a Notary Public to be valid. Also, to make your document more acceptable at financial institutions and other organizations, we recommend the presence of one or more witnesses. Please choose the appropriate options below. In North Carolina, your Power of Attorney MUST be signed in front of a Notary Public to be valid. Also, to make your document more acceptable at financial institutions and other organizations, we recommend the presence of one or more witnesses. Please choose the appropriate options below. In Ohio, your Power of Attorney MUST be signed in front of a Notary Public to be valid. Also, to make your document more acceptable at financial institutions and other organizations, we recommend the presence of one or more witnesses. Please choose the appropriate options below. In Oklahoma, your Power of Attorney MUST be signed in front of a Notary Public OR two witness to be valid. However, we highly recommend signing in front of both, as some financial institutions will not accept the document otherwise. Witnesses must be over 18, and cannot be the Attorney-in-fact, or anyone related to the Attorney-in-fact or Principal by blood or marriage. Please choose the appropriate options below. In Pennsylvania, your Power of Attorney MUST be signed in front of two witnesses to be valid. Also, to make your document more acceptable at financial institutions and other organizations, we highly recommend the presence of a Notary Public. Please choose the appropriate options below. In South Carolina, your Power of Attorney MUST be signed in front of two witnesses to be valid. Also, to make your document more acceptable at financial institutions and other organizations, we highly recommend the presence of a Notary Public. Please choose the appropriate options below. In South Dakota, your Power of Attorney MUST be signed in front of a Notary Public to be valid. Also, to make your document more acceptable at financial institutions and other organizations, we recommend the presence of one or more witnesses. Please choose the appropriate options below. In Texas, your Power of Attorney MUST be signed in front of a Notary Public to be valid. Also, to make your document more acceptable at financial institutions and other organizations, we recommend the presence of one or more witnesses. Please choose the appropriate options below. In Vermont, your Power of Attorney MUST be signed in front of a Notary Public and at lease one witness (who is NOT the Notary Public) to be valid. Please choose the appropriate options below. In Wisconsin, your Power of Attorney MUST be signed in front of a Notary Public OR two witness to be valid. However, we highly recommend signing in front of both, as some financial institutions will not accept the document otherwise. Witnesses must be over 18, and cannot be the Attorney-in-fact, or anyone related to the Attorney-in-fact or Principal by blood or marriage. Please choose the appropriate options below. Will a notary public be signing? How many witnesses will be signing? Do you wish to include a physician's affidavit to certify your condition if you have become incapacitated? We strongly recommend obtaining an attorney reviewed Power of Attorney directly from us.